Maybe it doesn’t take a production budget north of $100 million to crank out a superhero film these days. It does help to have a bit of imagination, though. Take away the bluster, arrogance and moral certitude of Tony Stark and you’ve got Bo, a teenage scientific genius living in a low-income neighborhood of Los Angeles, far from the monied paradise of Stark’s Malibu lair. Bo (Jacob Latimore) is the unlikely hero of Sleight, the latest offering from Blumhouse, the sci-fi and horror production house famous for Jordan Peele’s runaway debut, Get Out. Co-written by J.D. Dillard and Alex Theurer, Sleight tells the story of Bo, a young, uber-talented street magician with a college scholarship. He’s forced to decline it, though, and turns to selling drugs to support himself and his younger sister Tina (Storm Reid) after both of their parents die. Bo doesn’t really have the disposition for the more violent aspects of drug-dealing, however, and concocts a plan to sell off a kilo of cocaine and finally vault himself and Tina into a better life. 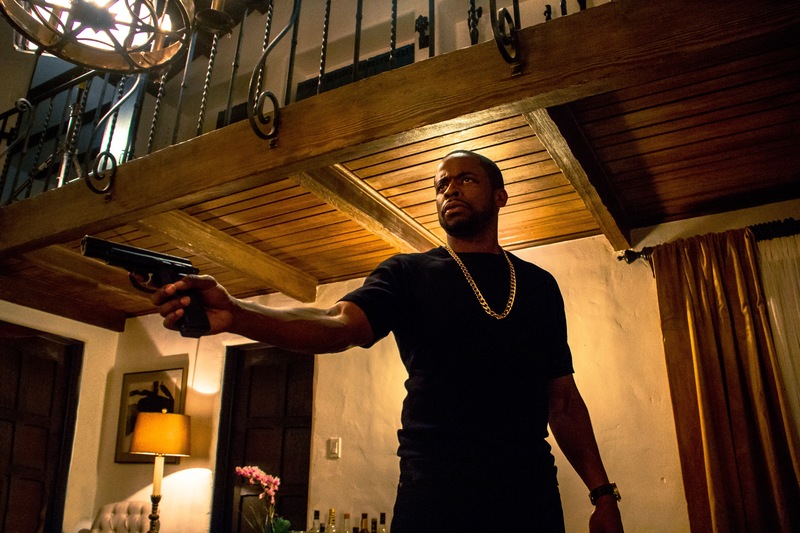 Unfortunately for Bo, his plan gets upended when he finds himself on his supplier Angelo’s (Dulé Hill) bad side, a situation that’s only exacerbated by the involvement of a rival coke slinger. Pushed to the brink, Bo seeks the counsel of his mentor and high school teacher to figure out how to get more power from the mysterious, festering scar high on his left arm. It turns out that Bo has fashioned a contraption that allows him to transform into something of a bionic man. It was a convenient device for mind-bending magic tricks, but Bo must figure out a way to defend himself from Angelo’s lethally violent tactics. Playing against type as Angelo, Hill is rather unconvincing as a hardened drug kingpin demanding his squad amputate the hand of a rival coke merchant with a meat cleaver. Aside from its use establishing Angelo as frightening, I’m not convinced that scene was even necessary. Sleight suffers from the lack of specifics that turn an intriguing idea into a film with a protagonist with whom we could become heavily emotionally invested. Instead, Dillard and Theurer whoosh through a series of generalities to get us to the good stuff. We know Bo lives in the ’hood, somewhere in Los Angeles, but we don’t know where. He talks about “getting out,” but not much beyond that. We know he had a scholarship for college, but not what school or for what field of study, though physics seems like a good guess. His girlfriend, Holly (Seychelle Gabriel), is in community college, but we don’t know where or what she’s studying. The result is a bland, underdeveloped portrait of Los Angeles, a city that requires a keen eye to pop, especially because so many films are set there. The result is a bland, underdeveloped portrait of Los Angeles. Because Sleight is a small indie that doesn’t have the luxury of wowing audiences with a ton of computer-generated imagery or other special effects, drawing out the small details of Bo’s life and making them feel special becomes much more important. Films don’t have to be expensive to be impactful; the dividends of a script that’s deliberate and considered can be massive. Sleight bears the mark of a screenplay that feels like it was dashed off in a few days. The value in Sleight is demonstrating that films don’t necessarily need big budgets to be entertaining, even when they’re about superheroes. I just wish the creators had taken a little more time to fully enliven the world around their extraordinary protagonist. Sleight is in theaters now.